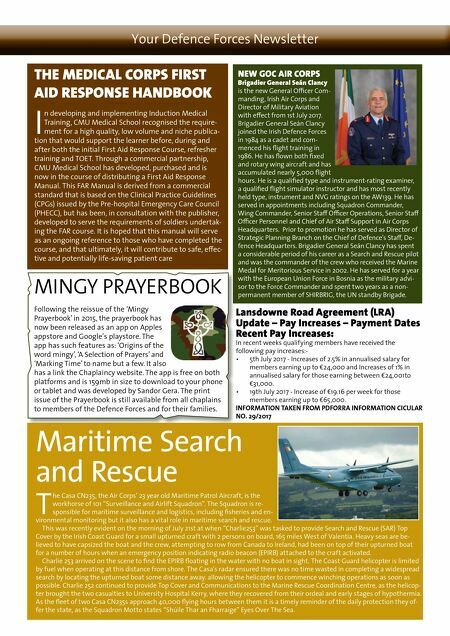 visit us at www.military.ie ADjUSTMENT OF PAY SCALES FOR THOSE OF PRIVATE RANk WHO ENLISTED IN THE DEFENCE FORCES SINCE 01 jANUARY 2013 A rising from discussions between PDFORRA and the De- partment of Defence, facilitated by the WRC, it was accepted that a variance had arisen between the savings required to be made under one of the savings initiatives agreed with PDFORRA in Haddington Road Defence Sector Col- lective Agreement (HRA) and the effect of the implementation of the payscales for new entrant recruits/privates at- tached to that agreement. As a result thereof, it was agreed that the relevant payscale would be adjusted in a manner which would continue to deliver the required savings into the future, as required under HRA. The above adjusted payscale, agreed by the Department of Defence and PDFORRA under the provisions of the HRA, will be implemented with effect from 1 July 2016. The above figures will require to be further adjusted to apply the terms of the Lansdowne Road Agreement 1 to them and this is currently being worked through. Arrangements are being made to calculate and pay any arrear payments due to those members who are covered by the revised arrangements. Revised payments can be found in the news section of the PDFORRA web- site in 'Information Circular No 24/2017'. INFORMATION TAKEN FROM PDFORRA INFORMATION CICULAR NO. 24/2017 The An Cosantóir 10k race will be held in the Phoenix Park on the 11th of October, 2017. To enter simply fill out an entry form, which will be made available online or directly from the office of An Cosantóir and send it along with the appropriate fee to the address below. If your unit is entering a block team please contact the office directly, the amount of block entries are limited so get your block in ASAP. If you're entering as a team make sure to specify this on your entry form in the ap- propriate box provided. • The Entry fee will be €10 per person. • The deadline for applications is the 6th October 2017. • No entries will be accepted after the deadline date. • Entry on the day will be €5, but, entrants will not be timed and will not receive a goody bag. • The race is open to all PDF, RDF, DoD, retired and invited personnel. 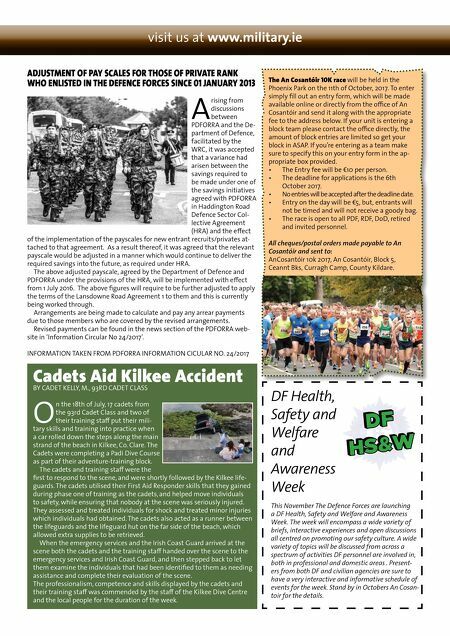 All cheques/postal orders made payable to An Cosantóir and sent to: AnCosantóir 10k 2017, An Cosantóir, Block 5, Ceannt Bks, Curragh Camp, County Kildare. Cadets Aid kilkee Accident By CADET KELLy, M., 93RD CADET CLASS O n the 18th of July, 17 cadets from the 93rd Cadet Class and two of their training staff put their mili- tary skills and training into practice when a car rolled down the steps along the main strand of the beach in Kilkee, Co. Clare. The Cadets were completing a Padi Dive Course as part of their adventure-training block. The cadets and training staff were the first to respond to the scene, and were shortly followed by the Kilkee life- guards. The cadets utilised their First Aid Responder skills that they gained during phase one of training as the cadets, and helped move individuals to safety, while ensuring that nobody at the scene was seriously injured. They assessed and treated individuals for shock and treated minor injuries which individuals had obtained. The cadets also acted as a runner between the lifeguards and the lifeguard hut on the far side of the beach, which allowed extra supplies to be retrieved. When the emergency services and the Irish Coast Guard arrived at the scene both the cadets and the training staff handed over the scene to the emergency services and Irish Coast Guard, and then stepped back to let them examine the individuals that had been identified to them as needing assistance and complete their evaluation of the scene. The professionalism, competence and skills displayed by the cadets and their training staff was commended by the staff of the Kilkee Dive Centre and the local people for the duration of the week. DF Health, Safety and Welfare and Awareness Week This November The Defence Forces are launching a DF Health, Safety and Welfare and Awareness Week. The week will encompass a wide variety of briefs, interactive experiences and open discussions all centred on promoting our safety culture. A wide variety of topics will be discussed from across a spectrum of activities DF personnel are involved in, both in professional and domestic areas . Present- ers from both DF and civilian agencies are sure to have a very interactive and informative schedule of events for the week. Stand by in Octobers An Cosan- toir for the details.